Grab some crunchy veggies and fluffy naan and dive into this Spicy Sweet Potato Dip! Left with a lone sweet potato in the pantry? That’s cause for celebration! Seriously! There are so many things you can do with a sweet potato. If you’re looking to make a meal out of it, try making a Savory Stuffed Sweet Potato, blending it into a pot of creamy Roasted Carrot and Sweet Potato Soup, or swirling it into a luscious parmesan cream sauce with this Sweet Potato Alfredo. All three recipes are made with just a single sweet potato! Simply feel like snacking? I GOT YOU. This spicy sweet potato dip is a crazy tasty. You can use it as a dip for crispy falafel, flatbread, carrot sticks, and/or pita chips or serve it up side-dish style as a base for your favorite protein and veggies. For a spicy kick to the taste buds, I added cayenne pepper and topped it with a drizzle of spicy sesame oil. Though I haven’t tried it, I feel like a little Sriracha might be a super fun addition too. Not a fan of heat? Skip things mild and skip the spice entirely! 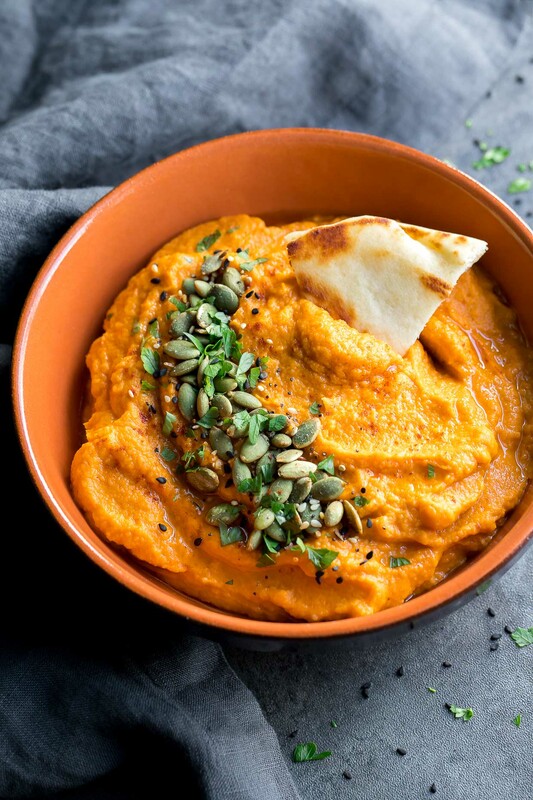 Grab some crunchy veggies and fluffy naan and dive into this Spicy Sweet Potato Dip! This vibrant vegetarian veggie dip has a hummus vibe without chickpeas! Recipe yields 1-1.5 cups dip. Pre-heat oven to 375 degrees F. Line a baking/roasting tray with parchment paper. Peel sweet potato and cut into one-inch cubes. Smash/flatten you garlic cloves with a knife. Spread garlic and sweet potato spaced on a parchment-lined baking/roasting tray and drizzle with oil. Sprinkle with salt and pepper and roast for 30 minutes or until tender and easily mashed with a fork. Allow to cool slightly, then add to a blender or food processor and puree until smooth. Add tahini, salt, cayenne pepper, smoked paprika, cumin and the juice from 1/2 a lime. Blend well. For a thinner consistency, add a little water (1 TBSP at a time) and continue blending until smooth and creamy. I like mine extra thick! Pour contents into a small serving bowl and surround with your choice of fluffy flatbread, pita chips, and carrot sticks. For a side-dish vibe, use the dip as a flavorful base for your favorite protein and veggies. Enjoy! I topped mine with a hearty drizzle of spicy sesame oil and basically wanted to demolish the bowl! You can also add roasted pepitas, toasted sesame seeds, or even spicy seasoned nuts if you'd like to add a garnish. <-- totally optional! For extra heat, swirl in some additional cayenne pepper, to taste. 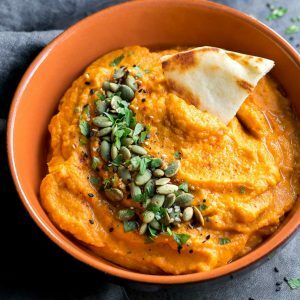 Inspired by Cookie and Kate’s Spicy Sweet Potato Hummus but with a chickpea-free twist! Love legumes? 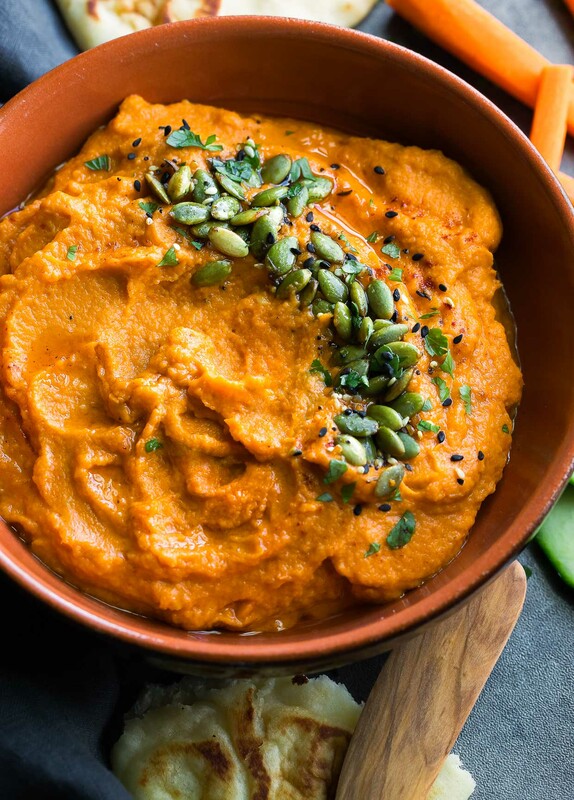 You can 100% puree a cup of garbanzo beans or white beans into this tasty sweet potato dip. Simply re-season to taste after the addition, top with a drizzle of your favorite olive oil, and have at it! Spicy harissa-infused olive oil would be AMAZING! Sweet Potato Chickpea Burgers – READER FAVORITE! I just made homemade tortilla chips this would be the perfect dip to use with them! Love a good sweet potato dip. Delicious! I love sweet potatoes and this dip is the perfect dip for my veggies!